Natural Menopause Relief with RemiSure black cohosh from the world's most tested brand! Our exclusive, standardized extract of black cohosh is clinically proven to provide a 70% reduction in hot flashes, night sweats, and mood swings. Plus improved Night-time Sleep with our herbal Restful Sleep Blend. Completely hormone free, without the plant-based estrogens that can affect breast uterine cell growth. 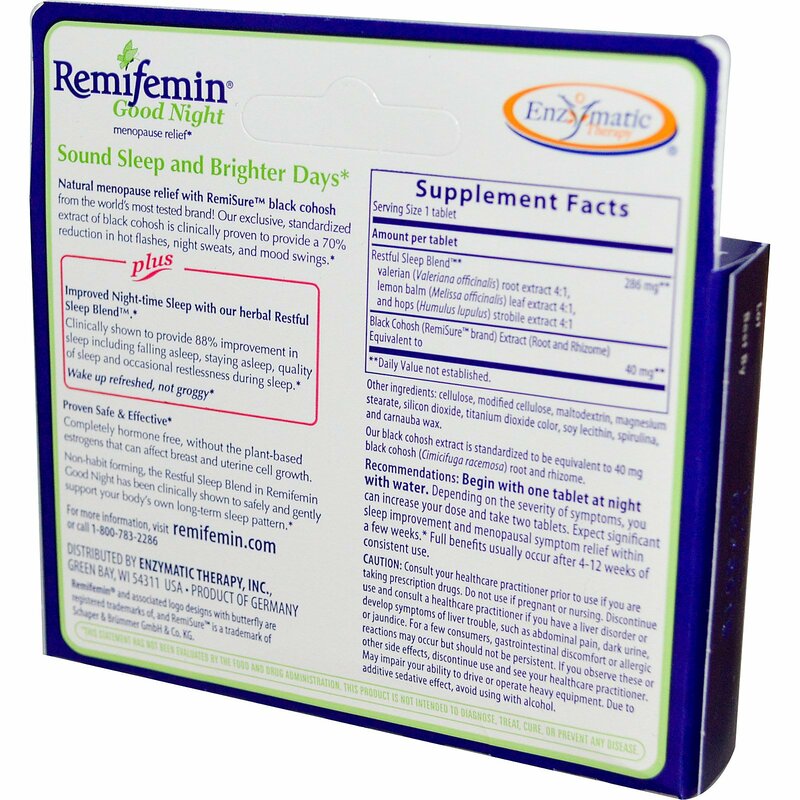 Non-habit forming, the Restful Sleep Blend in Remifemin Good Night has been clinically shown to safely and gently support your body's own long-term sleep pattern. Begin with one tablet at night with water. Depending on the severity of symptoms, you can increase your dose and take two tablets. 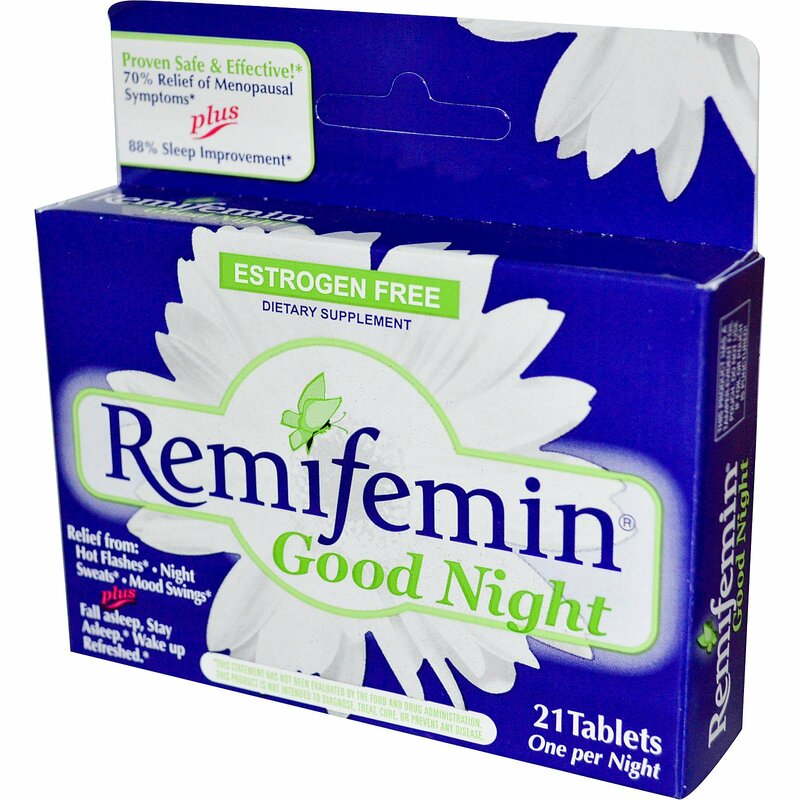 Expect significant sleep improvement and menopausal symptom relief within a few weeks. Full benefits usually occur after 4-12 weeks of consistent use. Cellulose, modified cellulose, maltodextrin, magnesium stearate, silicon dioxide, titanium dioxide color, soy lecithin, spirulina, and carnauba wax. Our black cohosh extract is standardized to be equivalent to 40 mg black cohosh (Cimicifuga racemosa) root and rhizome. Caution: Consult your healthcare practitioner prior to use if you are taking prescription drugs. Do not use if pregnant or nursing. Discontinue use and consult a healthcare practitioner if you have a liver disorder or develop symptoms of liver trouble, such as abdominal pain, dark urine, or jaundice. For a few consumers, gastrointestinal discomfort or allergic reactions may occur but should not be persistent. If you observe these or other side effects, discontinue use and see your healthcare practitioner. May impair your ability to drive or operate heavy equipment. Due to additive sedative effect, avoid using with alcohol.